Since I can't seem to post anything much here, I will point you instead to the guest author bit I did today here. and locally at Webster's Fine Stationers. I'm incredibly excited about this book and grateful for everyone's kind words and support! 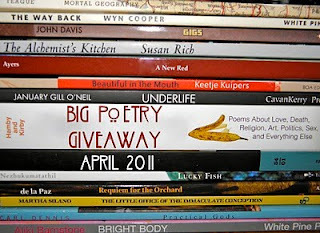 Winners of the Big Poetry Giveaway! 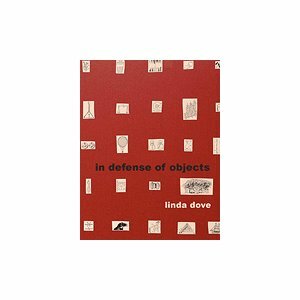 The person who will receive a copy of my book, In Defense of Objects, is the twelth commenter, Guy ‘Dhyan’ Traiber. I'll be sending you an email for contact info pronto! 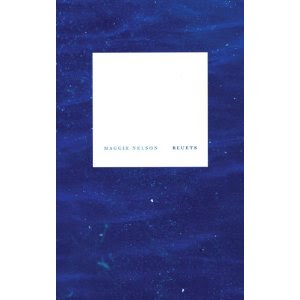 The second person to win, who will receive a copy of Bluets by Maggie Nelson is the nineteenth commenter, Samuel Sargent, who seems to have gotten exactly what he asked for! Hope you love it. Just give me a few moments to collect myself, and I will send out the contact emails for your mailing addresses, and your new treasures will be on their way to you. Thanks for participating! Long time, no blog. But as this thing is supposed to behave to some degree as a crass platform of self-promotion, we will be concentrating our energies there today. On March 1st, I received word that I had won the first annual Eudaimonia Poetry Review Chapbook Prize! And I was thrilled. 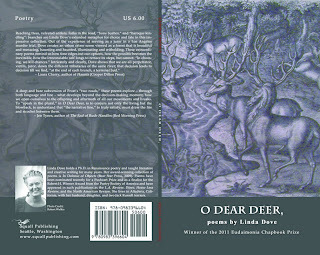 And completely grateful that my second book of poems was going to be published. 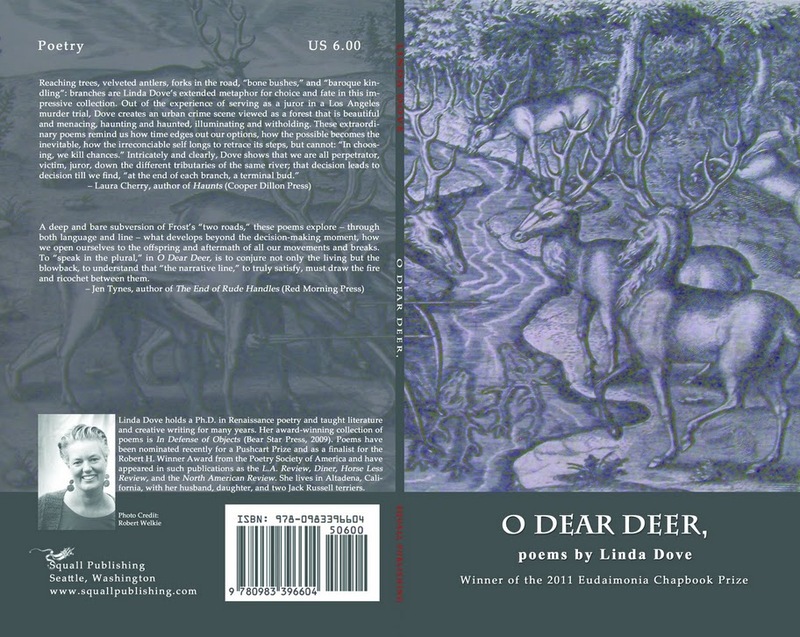 I worked on my chapbook, O Dear Deer, , for more than a year. It began in November 2009 as a response to being impaneled on a jury in downtown L.A., on a gang-related murder and attempted murder trial. It is not a retelling of the facts of the trial or even really about my experience as a juror, although the book reflects some of my ambivalence about that job, certainly. It is more like a preoccupation, an obsession even, with the larger questions that were at stake for me during that process, and the questions I imagined might be at stake for the defendant, the victims, the families, the witnesses, the lawyers, the judge, the other jurors. Or not. I don't know. But, for me, the haunting question was about who these people would be if they had never encountered each other on that particular day in the summer of 2007. If they had all walked down different paths to become different people. And the idea that maybe those doppelgangers exist somewhere, out there, just beyond where we can see, leading a life of our own other making. Maybe we live all the lives we make possible to ourselves, even if we live them (only) in our mind's eye, or in our dreams, or in our regrets. Or if our families live them for us. Maybe those other selves keep on walking. While many of the final selections were strong, the winning chapbook is a "stunningly rendered place of violent simplicity. It bewilders me while asking me to be wilder." The author, he said, has created "a hypnotic landscape of image rhyme that is better than surreal -- surrealism tries too hard. This is the dream space, the real dream space, and it feels effortlessly accurate. This collection shaves slivers from my bones." That makes me happy. Very, very happy. The press (Squall Publishing) will be releasing the chapbook (which is a short and tightly-thematic collection of poems) on July 1st. It is available for pre-order on Amazon here. Recently, R. pointed me towards a paragraph from a short-story called "The Patch" by John McPhee that appeared in the Feb. 8, 2010, issue of The New Yorker. He got my attention by claiming that he thought it came close to offering a metaphor for my aesthetic, my muse. That it sounded like the way I think about information, about history, about language, as I write poetry. Pickerel have palatal teeth. They also have teeth on their tongues, not to mention those razor jaws. On their bodies, they sometimes bear scars from the teeth of other pickerel. Pickerel that have been found in the stomachs of pickerel have in turn contained pickerel in their stomachs. A minnow found in the stomach of a pickerel had a pickerel in its stomach that had in its stomach a minnow. is fantastic. Must. Now. Write. Poem. About. Pickerel.
. . . There is there. There is not here . 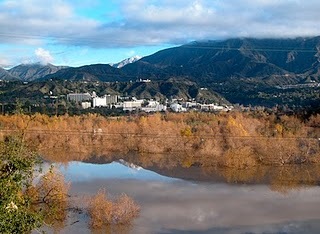 . .
On July 12th, the Pasadena City Council will decide whether to proceed with a plan to build soccer fields in Hahamongna Watershed Park, between the San Gabriel Mountains and the Arroyo Seco. I may write poetry, but I am also a soccer mom. My daughter belongs to the AYSO (American Youth Soccer Organization) Region 13 (Pasadena, Altadena, La Canada). By definition, by regulation, all soccer fields are the same. Thus there is always an alternative soccer field. Yet Hahamongna Watershed Park is unique. Why would we choose to replace what is rare with what is routine?